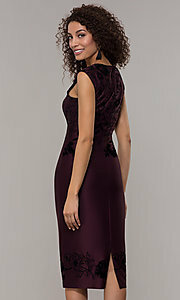 This budget-friendly fig purple wedding-guest dress offers a lot of style with a small price tag. Ideal for weddings and other semi-formal events, the short designer dress by Ignite Evenings is sure to please. 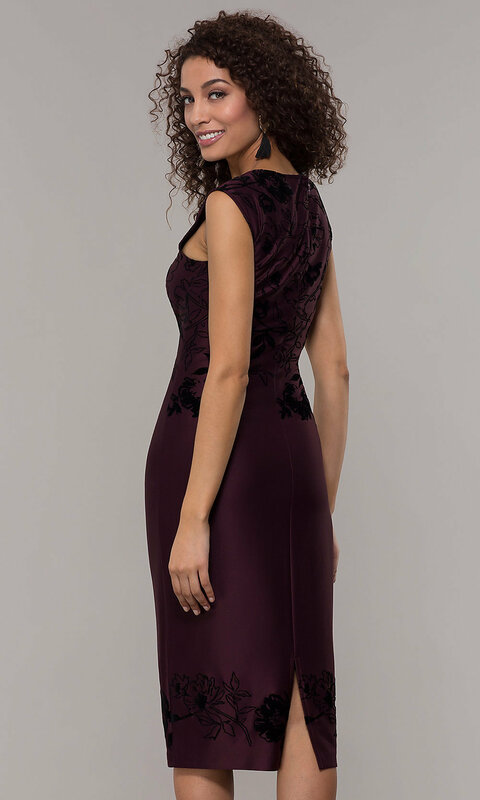 The sleeveless scoop-neck bodice on the stunning knee-length wedding guest dress is covered in rich black velvet appliques. Beginning at the natural waistline, the fitted skirt of this sheath-style dress ends at an applique-accented hemline and offers a centered back slit for added mobility. The best thing about this gorgeous wedding guest dress is it is unbelievably priced under $100, keeping you on-trend and on budget.